2013 17.2h AQHA/APHA stallion. Blue has been shown twice. His first time ever shown, he was top ten in the two year old hunter under saddle at the 2015 APHA World Show. Then he followed up at the 2016 NSBA World Show with a top five finish in the open three year old hunter under saddle. He will continue his show career and stand to a limited number of outside mares in 2017. 2012 16h AQHA/APHA All-Around gelding. Miles is currently leading the nation in the following rookie amateur events: showmanship, hunter under saddle, hunt seat equitation, western pleasure, and horsemanship. He has been all-around rookie amateur at every show he was shown at in the U.S. in 2016. He also has open points in halter, hunter under saddle and western pleasure. 2007 16h APHA Breeder's Trust All-Around mare. Suzie has a superior in open western pleasure and ROMS in multiple events including hunter under saddle, showmanship, horsemanship, and equitation. She has accumulated several year-end and circuit high-point and reserve high-point awards. 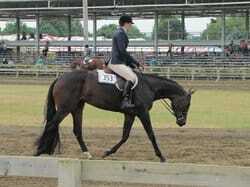 2010 16.1h AQHA mare. Olivia has been shown successfully in hunter under saddle and was in the Top 5 at the Tom Powers Futurity. 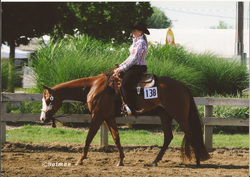 She has gone on to prove herself in the showmanship, hunter under saddle, and hunt seat equitation. She has earned numerous circuit championships and all-around awards.